Sue and Sue's mother, Birdie and myself arrived at the beach for our friends 50th wedding anniversary. There was a great party for family and friends. I was standing on their deck and took this image of haystack rock which you can see below. The weather turned beautiful in the afternoon of both Saturday and Sunday and we took some great walks along the shoreline. Sunday afternoon there was a wedding on the beach with about a hundred people. The interesting thing about the wedding is they had a brass band led by a tuba player that led the procession into town and to a meeting hall for a reception that had to be a lot of fun. Next weekend we leave for Columbus, Ohio for the Heart of Ohio Tole Show. Sue and I always look forward to this show because is so well run and we get to see all of our friends from the painting industry. The next weekend after that we travel back to Portland. The next weekend brings Sue to her class reunion which I know she is looking forward to seeing old friends. That means we will not be back to the coast until Labor Day Weekend. July 4th, 2008 Cannon Beach, Or. The whole family, including Sue's 94 year old mother, Birdie went to the beach for the weekend. The weather was good and the festivities were wonderful. We went to Manzanita, Or. for an old fashion 4th of July parade. The city of Manzanita has about 870 full time residents. At the time of the parade there were about 5000 people in the town. The parade lasts for about one hour and 15 minutes. It has to be a huge task for this small city to co-ordinate and pull off a parade of this size. Grandma Sue and Saylor are part of the crowd that have lined the entire length of the town to watch the parade. Our other grandchild, Fischer is standing in the street trying to catch as much candy as possible from the different floats as they pass by. This is truly an All American way to spend the 4th of July. Everyone gets in the spirit if the holiday. Before the parade begins there is a national guard fly by on the entire coast from Astoria down to Brookings. To hear the jets and then see them overhead just wants to make you celebrate the 4th. After the parade we had a real 4th of July cookout at our daughter's house. Kimberley had about 40 people over and everyone enjoyed the afternoon. I would say there was about 20 young children and all were well behaved. A man called "The Voice" set up a stage and microphone and entertained everyone in the Frank Sinatra style of vocals. The crowd grew very large to listen. Saylor and Fischer even did their bit to help celebrate. Saylor is five and Fischer is 7. What a treat they have been. Sunday morning we went up to Astoria for the farmers market. I think it is the largest market in Oregon. 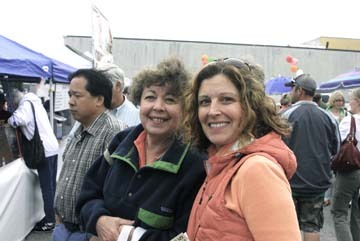 You can find crafts, food, plants , produce and flowers. I enjoyed looking at the different booths that featured photography. We had lunch at the food court and everyone got something different. You could choose Mexican, Bar-b-Que, fish and chips and assortments wine, beer or exotic lemonade's. All the food was good and all the food booths were busy. From Astoria we crossed the Columbia River into Washington. The bridge is over 4 miles long. 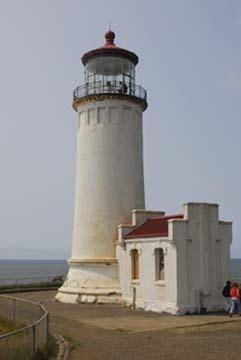 We ended up at Cape Disappointment where there are two lighthouses within 2 miles of each other. This is the only place on the entire coast of the United States that have two lighthouses so close together. 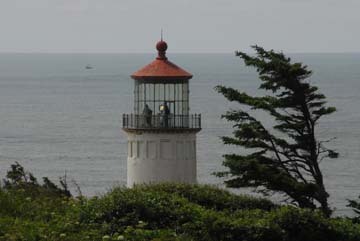 The above shot is the north lighthouse. This images was taken as we were leaving the north lighthouse and heading for the the gift shop and our car. We drove a short distance to the south lighthouse. As you can see it is the perfect spot for a picnic. To the left is a small crescent beach that is perfect for wading and going into the water, but I have to tell you the water is cold. We had a full and wonderful 4th of July weekend. Sue and I feel blessed to live in such beauty. This one had another arch and was called Arch Rivals. This is about half the number of people who came to watch the creations.